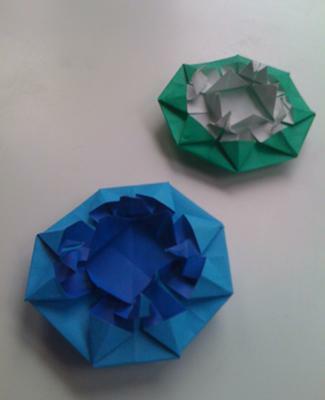 I was testing out designs from other origami creations, then, I made a mistake... and it looked kind of good! So I continued, and by trial and error, I finally got this! I think it looks good for a water flower and I hope you like it! I have recently started a likeness to origami and am trying new things every day. This site has been helpful to me up to a great extend in learning new methods and shapes. Water flower seems to be an easy one, actually. Click on write my essay and look for the best help! wow this is really good! im SO going to try to make this! How shall i know the instructions to do this? COOL I LUV WATER FLOWERS!! that is really Impressive. Like Something out of those really hard fancy books! Just so creative--- you should keep up the good work!!! You just created a new design! you know what i would love, mr. julian: an actual pond in the shape of your origami design! Or a pool would do, too. wait. i could necet do this! Is it true you are 9 years old? This really looks like something you might see floating on a pond. I love the way you explained how you came to create it.